If seasons were named a color, Autumn might be Orange. Or some variation more enticing, a Benjamin Moore tinted swatch in the Fall family you might paint your room, say, Harvest Moon, Warm Sunglow, Pumpkin Pie. 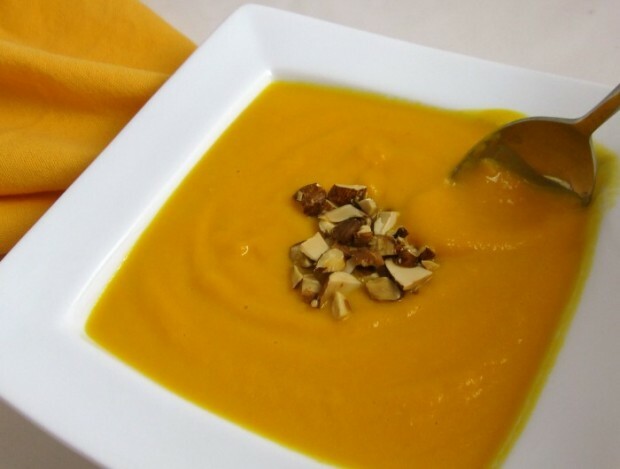 I recently received a comment from a reader who’d enjoyed a carrot soup I make. Memories of the lovely flavor profile–autumnal aromatherapy–lodged into my brain all day, before unleashing into supper. Here are a group of lovely transitional soups to warm your soul like a favorite sweater, all in shades of orange. Links to their recipes may be found at this blog’s conclusion. Of late, the recipes I’ve been making day-to-day are found in the annals of my dinnerFeed search engine; proofing an old recipe is far easier and faster for me than creating a new one. All of my creative pistons are exhausted by my efforts of late to publish my first novel: Simmer and Smoke; A Culinary Tale. It’s a smoldering novel weaving two women together in a landscape of organic farms, underground dinners and shadowy borders; some borders not meant to be crossed. The book explores the concept that if reality is smoke and mirrors, than is fantasy our virtual truth? I’m close to the finish and have begun my second book: The Painted Dog. It’s taken me several years to write Simmer and Smoke, and the wisdom of smart, thoughtful editors to assist along the way. I’ve heard that publishing a book is harder than writing one, and I’m starting to believe that this is true! More Recipes Filed Under "All Soups"
Sorrel-Potato Soup, the perfect spring soup, is delicious served hot or cold.